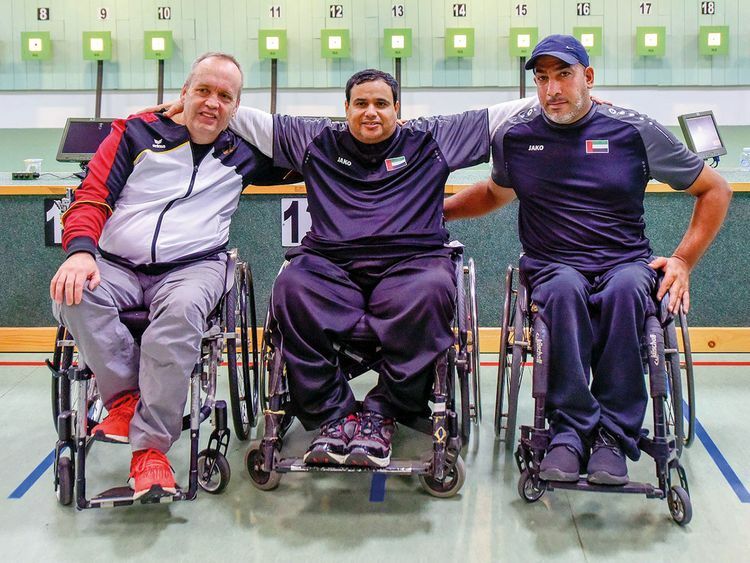 Sharjah: Emirati shooter Abdullah Al Aryani brought the UAE its first ever gold medal in the R1 10m SH1 men’s category at the International Wheelchair and Amputee Sports (IWAS) World Games in Sharjah on Monday. German shooter Norbet Gau secured silver, while the bronze medal was claimed by the UAE’s Obaid Al Dahmani. Held Under the patronage of His Highness Dr. Shaikh Sultan Bin Muhammad Al Qasimi, Supreme Council Member and Ruler of Sharjah, day one of the IWAS World Games began with the shooting at the Al Dhaid Sports Club and wheelchair fencing at the Al Thiqa Club. The rest of this week will see 555 international female and male athletes from 50 countries locking horns in seven sporting disciplines, including archery, athletics, badminton, swimming, shooting, table tennis and wheelchair fencing, that will be held across three state-of-the-art facilities in Sharjah. An ecstatic Al Aryani said: “I am proud to have brought the UAE its first gold medal in this sporting category. All our achievements is a result of hard work and dedication shown by us, which have always received the unwavering support of our wise leadership.